----Byron Wilcott featured in Tyler, TX. Byron Wilcott, aka Angel Of Sin, aka Lennox McEnroe in Florida Championship Wrestling the Developmental Territory of World Wrestling Entertainment was scheduled to meet FEW Champion Spiro in Tyler,Tx at the Lonestar Event Center on August 22nd. Spiro canceled due to medical reasons. Taking his place instead was Texas Champion ‘Cowboy’ James Claxton. Claxton left Tyler without the title. This part of an inter-promotion match up between two of the top indy promotions in Texas. In a match that was described as nothing less than a brawl, both men Claxton(TWE) and Wilcott(FEW) actually left the gated area around the ring at one point, and at different times had the advantage. Wilcott vs Claxton was a match up rival promotions Texas Wrestling Entertainment and Full Effect Wrestling. ‘Not only were the titles on the line, but pride as well. Both individuals were representing their company's at the highest level’ said FEW promoter Mark Vaughn. Claxton(TWE) and Wilcott(FEW) battled for over 20 min. Wilcott's ace in the hole was his manager Mark Weston. 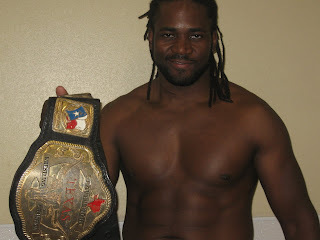 Wilcott defeated Claxton to become the new Texas Champion. Prior Texas Champions have included Hotstuff Hernandez, Mike Foxx, AJ Styles, Lance Cade, and Bryan Danielson among others. "My sights are still set on defeating FEW Champion Spiro, whenever he’s done dodging me," Wilcott added. The FEW title is held by TWE representative Spiro, who defeated Rudy Boy Gonzalez(TWE) in Daiseta, Tx April 30,2010. Congratulations to Byron Wilcott. Wilcott is available for Title Matches. Please e-mail texaswrestlingentertainment@yahoo.com with date. Also on the same night in Tyler, FEW Tag Champions Strong Style turned back the team of Degeneration Mex (Galan Ramirez/Rudy Boy Gonzalez). As of this writing, Nick Guidrey seems to have reinjured his knee. Strong Style none the less was able to survive the near scare. D-Mex says they will be lobbying for a rematch.